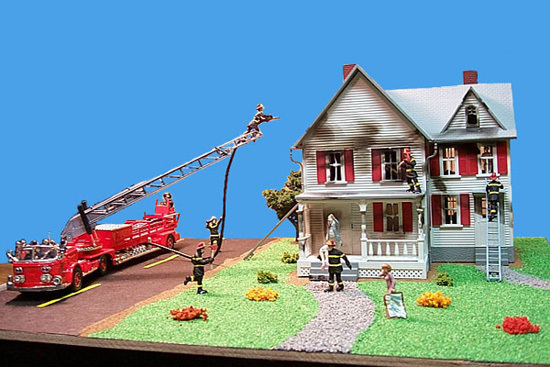 Fully weathered house "On Fire"
As plumes of smoke and flames billow into the sky, experience the heat, smoke and danger faced by fire fighters every day with the latest from Willard Animations. Add a touch of drama and excitement to your layout with this realistic and amazing accessory. Connect this accessory to your Lionel CAB-1 and when activated smoke will billow from the structure along with the sight and sound of roaring flames. Activate the pumps and the sound of fire trucks with bells clanging and sirens blaring can be heard while the fireman sprays real water to extinguish the smoke and flames. Position this accessory on your layout where ever desired. Includes die-cast fire engine and dual digital sound system as shown. TMCC capatible (you must have a Command Base and CAB-1).